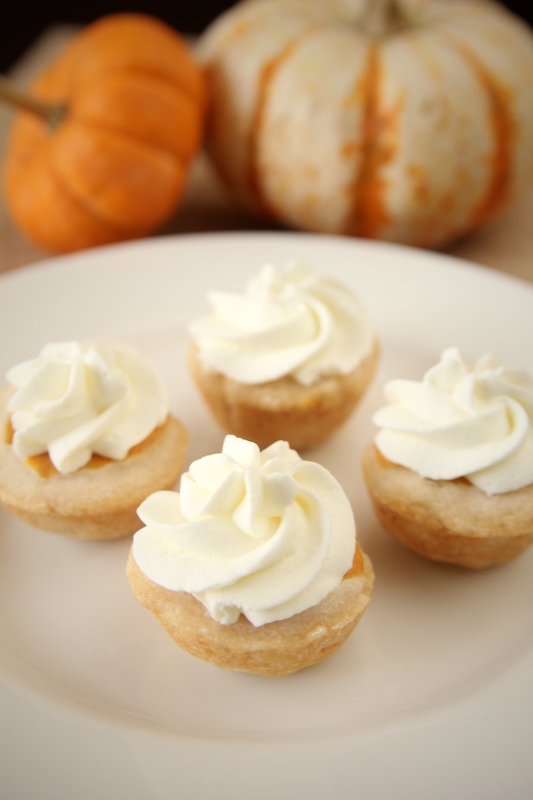 These little bites of Thanksgiving goodness are a fun way to have your pumpkin pie with a twist on Thanksgiving day. They are the perfect ratio of pumpkin to crust to whipped cream. They are also adorable…and who doesn’t want an adorable Thanksgiving dessert? Use cookie cutter to cut 12 circles from each pie crust.Press dough shapes into a 24 cup mini muffin tray. (Make 12 at a time, alternating cups to make sure pie crusts don’t overlap each other.) Apply egg whites from one egg to the top edges of each pie. Mix cream cheese, sugar, canned pumpkin, remaining 2 eggs, vanilla and pumpkin pie spice together until thoroughly combined. (You will have lots of extra batter if you are making the mini pies) Spoon mixture into each pie crust. Bake for 12-15 minutes. Cool and top with whipped cream. You can use cool whip or whip cream from a can, but homemade whip cream is quite holds up better and tastes amazing. Combine cream, sugar, and vanilla. Whip until light and fluffy. Pipe onto pies and enjoy. This entry was posted in Bite Size Goodness, Pies and tagged Pumpkin Pies. Bookmark the permalink.